NEW Detailed SCARY, SPOOKY and GROSS... Fresh Decor from a Creepy Haunted House! 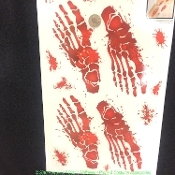 HALLOWEEN Prop Decor Window Cling - Can be used on floors, doors, mirrors and windows. -Each individual foot print approx. 7.5-inch (18.75cm) long x 3-inch (7.5cm) wide, plus ten assorted 1-2-inch (2.5-5cm) size mini blood-drop spatter stickers. Easily peel 'n' place on any clean smooth surface. Perfect decoration or prop for any room! Blood red printed smooth clear plastic stickers can be displayed on flat slick non-porous surface. Easy to use - Removable - Peel'n'Place - Will adhere to most smooth surfaces. ***WARNING*** MAY DAMAGE CERTAIN SURFACE FINISHES. *DO NOT USE ON CARPETS or PILED SURFACES! Place this decal on floors, mirrors, car and house windows, refrigerators, toilet lid, etc. as a creepy surprise for family and guests! 2) Remove cling from original backing and apply to DRY surface.